The Indiana University Bloomington ranking is 58th in the USA and 97th in the world on the University Review College Ranking List. It is ranked as the 107th best college by Forbes, and the 76th best by the USnews. The Indiana University Bloomington tuition fees are $10,388 for in-state and $33,241 for out of state students. It is a moderately selective college taking in 72.2% of applicants. Financial aid offered totals $161 million per year, an average of $11,750 per student. Indiana University Bloomington photograph by Raul Pacheco-Vega. SAT scores for admission requirements (25th-75th percentile) are Math 540 – 650, Reading 510 – 630, and writing 510 – 620. The total composite range is 1060 to 1290. The requirements for ACT (25th-75th percentile) are Composite 24 – 29, English 24 – 30, Math 24 – 29, and Writing 8 – 10. 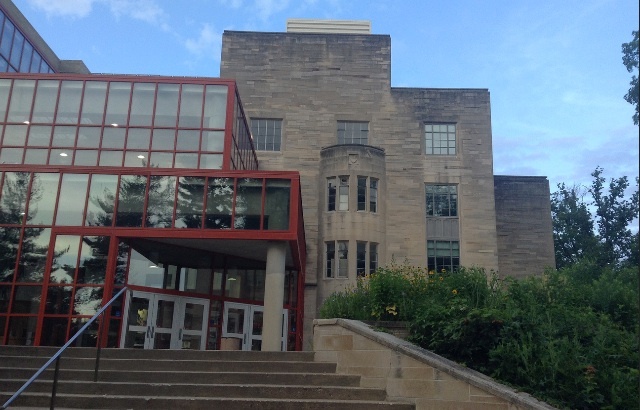 The Indiana University Bloomington (IU Bloomington) is famed for its ability to blend studying at an higher education facility with a purpose of self-sense that students develop when they go to college. In the United States more so than any other country in the world at the moment, university is as much a social experience or a rite of passage as it is a higher learning experience. People are expected to mature and learn more about both themselves and the outside world when they go to college and that is why places like Indiana University, Bloomington, IN are rated to highly by their students. This is not to say by any stretch of the imagination that the academics there are not strong; far from it in fact. There are 130 undergraduate majors available to choose from at Indiana University and in addition to that there are 320 other programs in terms of minors and other like degree programs that can be added to your degree along with a major. If you can think of something that would make a good major at Indiana University, then chances are pretty good that it is available. Of the 320 different programs that are available, over 100 of them are ranked within the top 20 in the USA when compared to similar programs from other colleges. It is a great university when it comes to studies, but it is an even better one when it comes to student life. The idea of learning how to be self sufficient as well as learning how to build network contacts and relationships to last the rest of your life is a big part of growing as an individual and when you are at Indiana University you will get the chance to do that as you learn more about your chosen field of study. All in all, it is definitely a university you would want to give a serious look to if you are interested in studying within the United States. As a Public Ivy institution, the education offered is similar to found at places like UCSB, Michigan State, Iowa, and University of Arizona. Other Indiana colleges include IUPUI, University of Notre Dame, and Purdue University. Motto: Lux et Veritas – Light and Truth. The Indiana University Bloomington ranking is as the 150th best in the world by the THE.